HEC – Victim of democratic dissolution? ISLAMABAD – Ever since the Implementation Commission of the 18th Amendment to the constitution announced that several federal ministries including the education ministry were to be devolved to the provinces, certain ambiguities started surfacing in the minds of the educationists and officials. One of the victims of this democratic move is an organization which not only created several hundred Ph.Ds for Pakistan but also earned international repute and esteem for the country. The decision of the government to dissolve the Higher Education Commission (HEC) thus generated perplexity and uncertainty not only among intellectuals but also in the civil and social society of the country. On Tuesday, a few hundred students and teachers of the major universities in Islamabad and Rawalpindi including QAU, IIUI, NUML, AIOU, and NUST gathered in front of the HEC building to raise their voice against the devolution of HEC. “Higher education is vital to the future development of Pakistan and every effort must be made to ensure support to this sector” they believed. 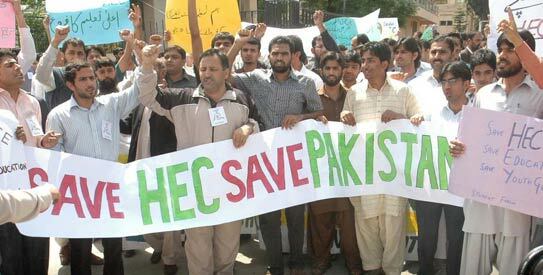 The protesters chanting the slogans ‘Save HEC, Save Education, Save the nation’ and ‘Stop disintegration of HEC’, recalled the words of renowned scientist Dr A.Q. Khan who has also vigorously opposed the move and called it “a sure recipe for disaster” aimed at (in his words) ‘destruction of the country’s highest forum (the Higher Education Commission) that guaranteed for quality of education’. Meanwhile, a report also claimed that due to the Government decision of dissolve the (the Higher Education Commission), the United States has instantly put on hold 250 million dollar aid meant for foreign scholarships and research for Pakistani students. Dr. Attaur Rehman, the commission’s founding chairman who held the position from 2002 till late 2008 has termed the dissolution of HEC as “a national disaster of horrendous magnitude that will push Pakistan back by 40-50 years.” In an apparently unsuccessful bid Dr. Rehman, has written several letters to the government pleading not to devolve this Federally-run esteemed Commission. “A multiplicity of standards and regulations would be disastrous and that is why the world over, including in India, higher education planning and funding is done centrally, even though universities are located in the provinces, he argued but failed to convince the democrats. Although, there has been criticism on Prof. Rahman, for spending billions of rupees without any visible impact on quality and performance of universities but “those who have closely watched the development and have been involved in the programmes in the past eight years can testify to the contrary as the progress made (by HEC) was breath-taking and has put Pakistan ahead of comparable countries in numerous aspects” stated Dr. Michael Rode, Chairman/European Coordinator of Network of European and Asian Universities (ASEA-UNINET). It remains an undeniable fact the while Pakistani universities managed to produce nearly the same number of PhDs in the last 8 years (3280) in 55 years, HEC produced a record of 3000 Ph.Ds during a short span of time. Since the inception of HEC, research output has also grown six-folds since 2002 (from 815 in 2002 to 5068 in 2010). Other accomplishments of the HEC include the establishment of a free access to scientific literature by high-speed Internet for all universities, thousands of promising young scientists who were granted PhD studies at top universities abroad, the upgrade of research equipment accessible across the country and the programme of establishing new universities of science and technology, including technology parks attracting foreign investors, prove the efficiency and the long-term benefits for the country. According to Athar Minallah, a lawyer “the amendment made it a constitutional requirement for the government to devolve all those subjects to the provinces that the 1973 Constitution originally listed as Concurrent (that is in the shared administrative control of the federal and the provincial governments).” However, there is also a difference of opinion among educationists and legal experts with some of them claiming that the 18th Amendment provides legal cover to functions of the HEC. Apart from all the wise arguments, the fact remains that the legislative, administrative, and financial relocation of the ministries from the federal to provincial level appear an uphill task for the people’s government mainly when the citizens of the democratic country are ardent to use their right of freedom of expression to protest against government’s move to dissolve HEC.